Atlanta at Arizona (Saturday, January 3rd) The 9-7 Cardinals have just ZERO wins, against non-divisional opponents since October 13th. Why is this important? Aside from the Cardinals, the NFC West managed just a 13-35 record this season. Kurt Warner and company are stumbling into the playoffs, after losing 4 of their final 6 games. To make matters worse, the team they are playing in the first round of the playoffs, the Atlanta Falcons, allowed the 8th fewest points per game during the regular season. However, it isn't all bad for the high flying Cardinals, they get a home game. In 2008 the Cardinals were 6-2 in the state of Arizona, and one of those losses took place after, they'd already clinched a playoff birth and a division title. More good news, the Cardinals average 288 yards through the air, good for second highest in the NFL, and they'll be playing a defense that ranks 22nd against the pass. Their opponents are no cake walk though. The Falcons closed out the regular season with the longest winning streak (3) among NFC playoff teams. They're 7-2 since November 1st, boast road wins in the final month against playoff teams Minnesota and San Diego, and hung 42 on the second seeded Panthers, just a month ago. Falcon RB, Michael Turner, finishes the season second in rushing yards (1,699), 61 yards behind Viking RB, Adrian Peterson, the same Adrian Peterson who cut up the Cardinal defense to the tune of 165 yards, at their place, only three weeks ago. If that isn't a sign of concern for the Cardinals maybe this will be, Turner went over the century mark 8 times this season, including two games of 200+ yards, one in week 1 and the second in week 17, does it look like Michael Turner is slowing down? While rookie head coach, Mike Smith, and rookie quarterback, Matt Ryan are the toast of Atlanta, running back Michael Turner is the backbone of the Falcon offense and should be garnering serious MVP consideration. Baltimore at Miami (Sunday, January 4th) Read that match up again, because one year ago these two teams had a combined record of 6-26. The Dolphins 1-16 record gave them the top pick overall in the 2008 draft, and the Ravens 5-11 record got their head coach fired. A year later, (insert time machine noise) the Dolphins are the current AFC East Champs with an 11-5 record and have won 9 of their final 10 games. Baltimore is going into the playoffs with the same 11-5 record, a rookie head coach and quarterback, and more importantly, they've put the bite and bark back into their defense. The Fish opened up their season with a loss to the division rival Jets, and ended their regular season with a division clinching victory over those same Jets at their place, does it get any better? Yes. President of football operations, Bill Parcells, in one game, successfully knocked out two of his former teams from playoff contention, the New England Patriots and New York Jets, Auf Wiedersehen. Funny thing here, we've seen this match up recently. In week 7, the Ravens traveled to Miami and beat up the then 2-3 Dolphins, 27-13. A game that was highlighted primarily, by the return of former Dolphin head coach, Cam Cameron, to Miami, as the Ravens offensive coordinator. First year quarterback, Joe Flacco, was a workman like, 17 of 23 with 232 yards passing and one touchdown. 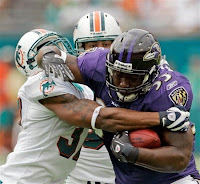 Running back, Willis McGahee rushed for over 100 yards and the Raven defense was . . well, the Raven defense. Linebacker, Terrell Suggs, returned a Chad Pennington interception 44 yards for a touchdown. Why might this game be different than the game back in mid-October? Because these aren't your fathers Dolphins (or they might be if your father was a big Marino guy). Quarterback, Chad Pennington, now has 16 starts under his belt in a new system. The veteran Pennington has thrown 13 touchdown passes and just four interceptions since that last start against Baltimore. That loss to Baltimore, in week 7, was the game that woke up the Dolphins, they'd finish the remainder of the season nine wins in ten games. Philadelphia At Minnesota (Sunday, January 4th) Someone wanted to see the Eagles in the playoffs. 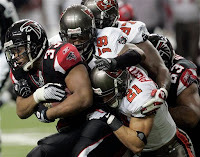 The Tampa Bay Bucs needed just 1 victory in their final four games to get into the playoffs, and they couldn't do it. You played road games against Carolina and Atlanta, lost 'em both. You had upcoming games against San Diego and Oakland at your place, while teams traveling across the country playing in that 1:00 time slot were like 2 for 189,058 and you blew it. The Eagles had to do what they could, win a couple games and punch their ticket, but they needed some help from the Bucs. Thanks for the late Christmas gift Tampa Bay, love, Donovan F. McNabb. Let me get this out of the way real quick, the Eagles are still the Eagles. They might have started the season 2-3, they might have been the only team that has no idea that a regular season game can end in a tie, and yes, they did bench their hall of fame quarterback in favor of a second year guy who would go on to throw two interceptions and have a passer rating of %15.3 but they're still the Eagles. As much as you can't stand to watch them play, they're going to win some games you think they can't. As for the Minnesota Vikings, they are going as far as Adrian Peterson takes them. Period. Nuff said. Put it in the bank. From week 9 to week 17, the Vikings were 7-2. In six of those nine games, Peterson ran for over 100 yards, in two of those six 100 yard games, he went over 150. Against a downright filthy defense in Chicago, Peterson averaged 126 yards each game against Urlacher and Co. When I say as Peterson goes, go the Vikings, I mean it. Over the final two and a half months of the season the only teams which beat Minnesota, Atlanta and Tampa Bay, held him under 100 yards. The Eagle defense and coordinator Jim Johnson give up only 92.3 yards a game and have allowed just seven rushing touchdowns on the season. Between Brian Dawkins, linebacker Stewart Bradley, and defensive end Trent Cole, the Eagles bang up rushing attacks. Indianapolis At San Diego (Saturday, January 3rd) I'm glad to see the Chargers are awake. Your 8-8 playoff bound, AFC West Champion, San Diego Chargers are hosting the 12-4, second best record in the league, Colts. Before we throw another MVP trophy at Peyton Manning for operating with the same coach, in the same system, and recording the same amount of wins as always, take a look at Phil Rivers. (I'm dropping in the "IP" from Philip, he's 27 and only his mother should refer to him as Philip) Let's face it, the Chargers may not have the best record among playoff teams, but do you want to count them out? The same team that lost four games by two points or fewer? When their playoff lives were on the line, the Chargers flew to Tampa Bay and upended the legendary cover 2 Bucs defense, 41-24. With Denver coming to their place in primetime with the division on the line, Phil Rivers and the Chargers dropped a 50-spot on the board. The same Phil Rivers that we bang on because maybe he isn't Drew Brees, has tossed 34 touchdown passes, has a passer rating above 105, and threw for over 4,000 yards on the season. More touchdown passes than Manning, more yards than Manning, and a better passer rating than Manning. An aging Tomlinson in the backfield and Phil Rivers hasn't missed a beat. 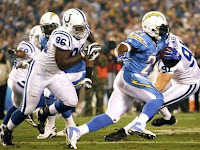 As for the St. Louis Cardinals of the NFL, the Indianapolis Colts, the ever consistent Colts finished 12-4. (If you count that garbage win against the Titans in week 17) They were 5-1 against teams which are in the playoffs, those five wins include a 24-20 grind out victory over Pittsburgh, and a shellacking of Baltimore, 31-3. More importantly, it includes a road victory, 23-20, over the same Chargers they'll meet on Saturday. Two guarantees for this one: No way will this be a blowout by either team, they're too good for that. Lastly, winner of this game should get the MVP, big stage for Phil Rivers. Check back each day this week for another playoff preview: Tuesday is "The 5 Most Important People in the Playoffs"